GeoForce is now accepting applications for motivated individuals. Click on "CONTACT US" above to print an application or give us a call. GeoForce offers services to keep electricity flowing to your customers. Pole inspection, maintenance, preservation and restoration can extend the life of a pole generations beyond one that is left unattended. While at a pole, our inspectors note dangers and potential failures in the overhead system, as well as what lies below the ground line. Work is performed in a safe and timely manner to ensure that your assets are in better condition than we found them. 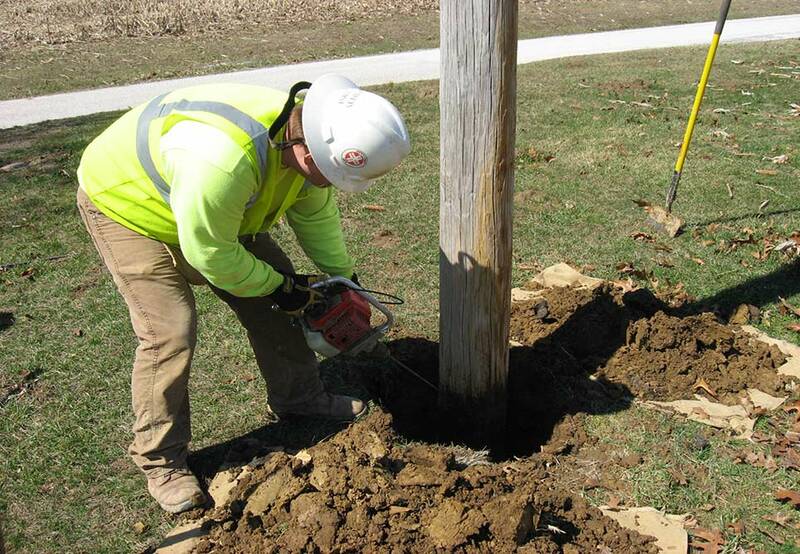 A full inspection process includes a visual overhead inspection, joint use survey, hammer sounding, boring to determine decay, digging 18 inches down around the pole, scraping or chipping off decayed wood, adding internal pesticides, applying preservative to the outside of the pole and wrapping it, backfilling the hole and tamping it down and finally marking the pole with tags to show what has been done. All of this is recorded into a handheld computer with GPS coordinates and potentially a photograph to return to the client. We work east of the Mississippi River with distribution and transmission electric companies, municipalities, communication companies, and in some cases smaller private companies with poles on their property.